Boy was I chuffed when I got one of these little beauties as an early Birthday present. (Thanks Darling!) I'd always wanted a mini digital camcorder, and the Vivitar DVR-310 fits the bill perfectly. 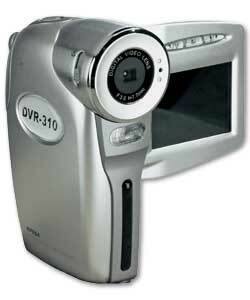 The 310 is an entry level digital camcorder, that can also take stills, record sounds and play back mp3s. For video it can take resolutions of 640x480 or 320x240. For stills the resolution is 3m, 1.2m or 0.3m. It has a built in flash, microphone jack, sd slot (up to 512mb) and speaker. It ships with a USB lead, soft case, mini tripod and AV leads to connect it to your TV. I've only been playing around with this camcorder for a few hours, but it has really impressed me with what it can do. Stills are ok, as long as light conditions are good and you've got a steady hand. The video captures again are acceptable. You're not getting DVD images here, its the equivalent of an old tape video camera, but obviously a lot lighter and smaller! So, who will this device appeal to? Well, I like it because it's small, you can take it anywhere and not be moaning about the weight. It will take video and stills. It takes the quality of video that I use a lot - the Vivitar creates small video files of an acceptable quality than can be emailed around family and friends, or put onto web sites easily. Ok, you're not going to be making feature films with it, just filming hours of fun with the family.